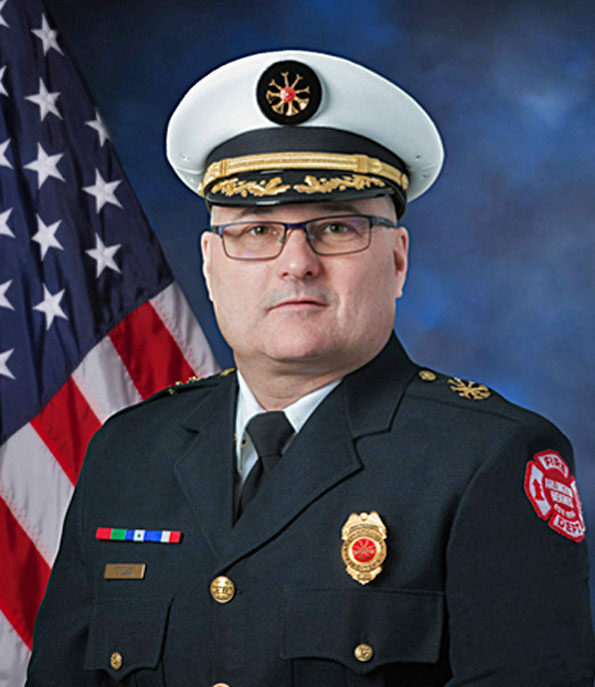 The Village of Arlington Heights on Friday, February 15, 2019 announced that Andrew Larson has been appointed as the new Fire Chief for the Village of Arlington Heights effective immediately. Chief Larson recently served as Acting Fire Chief since the retirement of Fire Chief Ken Koeppen on November 15, 2018. After 22 service years with the Arlington Heights Fire Department, most recently serving, the Village of Arlington Heights expressed confidence that Chief Larson’s extensive experience will serve him well in his leadership of the Fire Department. Chief Larson today became the 6th Fire Chief of the Arlington Heights Fire Department. Larson’s fire service career in Arlington Heights started in 1997 when he joined the Department as a firefighter. Larson rose through the ranks successfully holding the positions of Instructor at the Arlington Heights Training Academy, Firefighter/Paramedic, Firefighter/Engineer, Shift Lieutenant, Incident Safety Officer, Public Education Lieutenant, Battalion Chief, Deputy Chief since 2017 followed by his service as Acting Fire Chief since November 2018. Chief Larson’s education includes a Master’s of Public Administration, a Bachelor of Science in Fire Service and an Associate Degree in Applied Science, Fire Science. Chief Andrew Larson has also earned over 12 certifications from the Office of the Illinois State Fire Marshal and several certifications from the Federal Emergency Management Agency – NIMS (National Incident Management System). According to the Village of Arlington Heights, with Chief Larson’s leadership, the Arlington Heights Fire Department of 110 full-time employees will continue to provide residents and businesses with fire protection service, emergency medical services (EMS) and other rescue functions. The Department consists of four Divisions, Administrative, Fire Suppression, Emergency Medical and Training. There are also a total of four fire stations — all located strategically along Arlington Heights Road. The Arlington Heights Fire Department transitioned from a Volunteer Department to a full-time paid Fire Department in 1958. Fire Chief Andrew Larson, Arlington Heights Fire Department.